United States Secretary of State John Kerry held a news conference Sunday in which he praised Iran for its willingness to enter talks over its nuclear program, and answered critics of the deal the “P5+1” reached with Iran. “I know that there are those who will assert that this deal is imperfect. Well, they too bear a responsibility, and that is to tell people what the better alternative is,” Kerry declared. Netanyahu and Arab leaders urged western nations to keep the pressure on Iran through sanctions until Iranian leaders agreed to better terms. That was not an option, Kerry argued. “Some might say we should simply continue to increase pressure – just turn up the screws, continue to put sanctions on, and somehow that’s going to push Iran towards capitulation or collapse. Not by any interpretation that we have from all the experts and all of the input that we have, and from all of the countries – the P5+1 – that took place in this today, none of them believe that would be the outcome,” he insisted. “Instead, we believe that while we are engaged in that effort, Iran’s program would actually march forward… So we believe that you would wind up with an Iran with bigger stockpiles, with more advanced centrifuges and more progress at pursuing a plutonium track. And President Obama believes that doesn’t benefit anybody,” he continued. Kerry suggested that if previous U.S. administrations had been willing to compromise, Iran’s nuclear program would have posed less of a threat. “In 1973 – 19 – excuse me, in 2003, when the Iranians made an offer to the former Administration with respect to their nuclear program, there were 164 centrifuges. That offer was not taken. Subsequently, sanctions came in, and today there are 19,000 centrifuges and growing,” he said. Kerry also rejected arguments that the deal reached with Iran allows it to keep the essential elements of its nuclear program. “This first step, I want to emphasize, actually rolls back the program from where it is today, enlarges the breakout time, which would not have occurred unless this agreement existed,” he said. The main goal is to allow international inspection of Iran’s nuclear program, he added. Kerry thanked the U.S. negotiating team for its work. He also thanked Iranian leaders. “While we obviously have profound differences with Iran yet to be resolved, the fact is that this agreement could not have been reached without the decision of the Iranian Government to come to the table and negotiate. And I want to say tonight that Foreign Minister Zarif worked hard, deliberated hard, and we are obviously, we believe, better that the decision was made to come here than not to, and to work hard to reach an agreement. 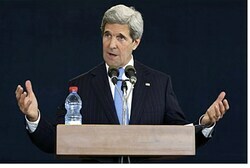 And we thank the Foreign Minister for those efforts,” Kerry said. Name of victim of terror attack released Erez Orbach (20) of Alon Shvut named as one of the victims of the truck terror attack at the Haas Promenade in Armon Hanatziv.